Shell was drafted by the American Football League's Oakland Raiders from Maryland State College. Playing offensive tackle, Shell participated in 24 playoff contests, including Super Bowls XI and XV, and was named to eight Pro Bowls. Shell was elected to the Pro Football Hall of Fame in 1989. In 1999, he was ranked number 55 on The Sporting News' list of the 100 Greatest Football Players. Through Al Davis, Shell is a member of the Sid Gillman coaching tree. 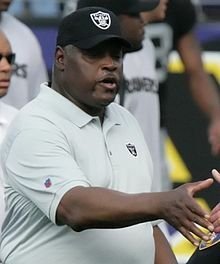 As coach of the Raiders (at the time located in Los Angeles), Shell compiled a record of 54 wins, 38 losses, and was named AFC Coach of the Year in 1990, when the Raiders won the AFC West division with a 12–4 record, and advanced to the AFC championship game in the playoffs, becoming the first African-American coach to lead the team to the Conference Championship game. Al Davis, owner of the Raiders, fired Shell after a 9–7 season in 1994, a move Davis later called "a mistake". After leaving the Raiders, Shell went on to coaching positions with the Kansas City Chiefs and Atlanta Falcons, before serving as a senior vice president for the NFL, in charge of football operations. Shell was officially re-hired by the Raiders as head coach on February 11, 2006. After leading the team to its worst record (2 wins, 14 losses) since 1963, despite having one of the best defenses, Shell was fired for the second time as head coach of the Raiders on January 4, 2007. Shell attended Bonds-Wilson High School in North Charleston, South Carolina. The school is no longer in existence. Shell is an alumnus of Maryland State College, now known as The University of Maryland Eastern Shore, located in Princess Anne, Maryland. Shell is a member of Alpha Phi Alpha fraternity. In 2013, he was inducted into the College Football Hall of Fame. He hosts an annual celebrity golf tournament. Art Shell is the great uncle of Brandon Shell who was a highly touted recruit out of high school who played offensive lineman for the South Carolina Gamecocks football team and was drafted in 2016 by the New York Jets. ^ "Brother Art Shell elected to the NFL Hall of Fame". The Sphinx. Alpha Phi Alpha Fraternity. Spring 1989. p. 19. Retrieved August 24, 2014. ^ Cullen, Rick (January 8, 1977). "The spotlight for Art Shell". Salisbury Daily Times. p. 18. ^ White, David; Gay, Nancy (January 5, 2007). "Shell fired by Raiders again / Davis called coach's '94 dismissal 'a mistake'; apparently thought rehiring was another". San Francisco Chronicle. Retrieved October 31, 2018. ^ "Jets Trade Up, Take T Brandon Shell in Round 5". www.newyorkjets.com. Retrieved April 30, 2016.